Years ago, Doc Swan once heard that the average person laughs eight times a day. To that the promptly replied, "I guess my audiences are above average". Fact, fiction and fabrication is what you will see when you witness the wackiness of "Doc Swan's - Comedy Magic and Sideshow". A presentation of Laugh-A-Minute magic combined with old-time (family friendly) sideshow stunts utilizing the most unlikely props and equipment, making for a performance sure to be enjoyed - and remembered - by all who watch. 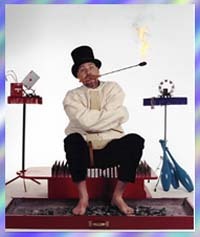 Doc has been performing for over thirty years at fairs, circuses, amusement parks (Like Walt Disney World, Six Flags and Universal Studios), and even had his own show on the Boardwalk in Atlantic City for two years running. A unique combination of skill, humor and a high threshold of pain have made him one of the most sought-after acts in the variety-entertainment world. Fire-eating, magic, juggling, walking barefoot across 100 broken glass bottles....all part of his everyday life. One minute you will be peeking through your fingers, the next you'll be wiping away tears of laughter". Come be a part of Doc Swan's audience...then you can consider YOURself above average!